Day 222 of Project 365: Third Time’s the Charm, a photo by cygnoir on Flickr. Saturday night’s dinner, a new recipe, was inedible. Last night’s dinner, another new recipe, was edible but on the wrong side of mediocre. 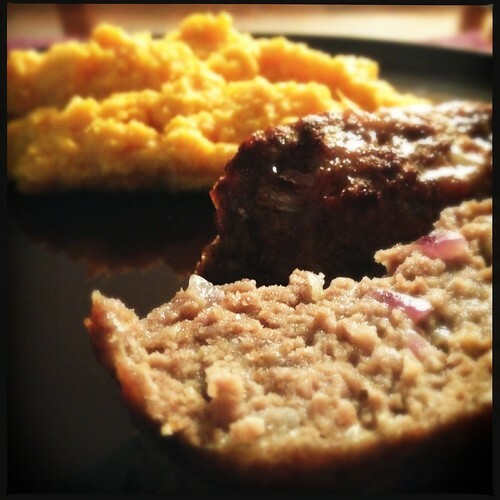 So tonight I decided that it must be meatloaf and sweet potatoes. Not particularly healthy, but worth it. Not for the first time, I’ve thought about doing a food blog. And a fountain pen blog. And a running blog. And a book review blog. And a knitting blog. Isn’t that the trend now, single-subject blogs? After a few minutes of plotting this out, I get extremely bored with the idea. The truth is I want to write about each of these things every once in a while, not just one of these things every day. To this end, I am reorganising some of my categories. Each one will have its own RSS feed, so if you’re only interested in reading about bean-plating, you can subscribe to the bean-plating feed. Although at this point I think we’ll all be excited to read posts in the category "Anything That Isn’t a Food/Cat/Book Photo and One Line of Description." More on the fancy category switcheroo soon.